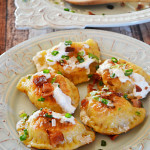 I wish I could tell you that there was some deep background history behind these pierogi– that my father grew up in Poland and brought back the recipe from his family’s long tradition, or that my mother used to enjoy them in the heart of Pittsburgh and shared the city secret of adding sour cream to the dough with me. However, that’s just not the truth. Truth is, the first real pierogi I tried were from a restaurant in my college town. It might not be the magical story you’re craving, but that’s when I started to dream about making pierogi myself. I always told myself that they’d be too hard, or take too long to make, that I’d have to learn how to mix the dough just right from someone who’d been doing it for generations, and so I stuck with the far less satisfying frozen kind. (Sorry, Mrs. T.) I was inspired to finally give it a go, though, by a weekly food challenge group I recently joined, and I couldn’t be more grateful for that push! 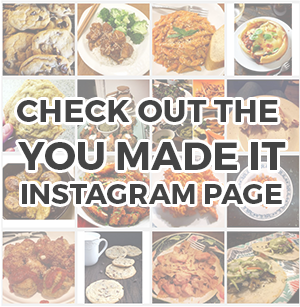 Moral of this story: Don’t be afraid to make these. They honestly don’t take that long to make, the dough is surprisingly easy to work with, and they are so, so, so insanely good. This recipe makes about 15 pierogi, but I doubled it and made my pierogi in bulk. That way I could freeze some of the uncooked ones for Super Bowl appetizers! 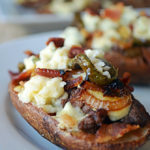 I don’t think anyone will mind, after all, they are loaded up with bacon, cheddar, caramelized onions, and potatoes. With a drizzle of sour cream on top, you’re practically biting into a little piece of heaven. 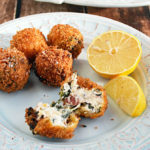 That is, of course, assuming that heaven tastes like unleavened dough dumplings, filled with flavorful ingredients, boiled and then pan fried in leftover bacon grease and a bit of butter. I can’t be sure, but it does sound heavenly, doesn’t it? In a large bowl, combine the flour and salt. Add in the beaten egg, sour cream, and softened butter. Mix for about 5 minutes, or until the ingredients are evenly distributed and the dough pulls away from the bowl. If your dough is still very sticky, add a bit more flour, and if it’s too dry, add a bit more sour cream. Remember, flour measurements by cups vary, so sometimes you may have to tweak your doughs to the right consistency. Wrap the finished dough in plastic wrap and set in the refrigerator. Refrigerate for at least 30 minutes, or up to 48 hours. Cook the bacon in a large skillet, crumble, and set aside. Add the onion, season with salt and pepper, and saute over medium in the bacon fat until soft and brown, stirring occasionally, about 30 minutes. Smash the boiled potatoes in a large bowl and add in the crumbled bacon, cheddar cheese, and the caramelized onions. Add salt and pepper, and taste test the mixture. Add more salt and pepper, if necessary. Roll the filling into 1″ balls. Remove the dough from the refrigerator, and roll out on a floured surface to about 1/8 inch thick. Using a circular cookie cutter or the top of a glass, cut the dough into circles. Place one ball of filling on each cut out and fold the dough into a semi circle around it. Using the tines of a fork, press together the edges of the dough to seal it together. Bring a large pot of water to a boil and add the pierogi. Boil them until they float to the top. Remove them from the water with a slotted spoon and let dry. Heat the remaining onion/bacon juices in the original pan. Add butter if necessary. Add a few pierogi to the pan at a time and fry until crisp. my last name ends in an -ski, so i felt like i had to learn! i love making pierogis, I do it about every 6 months and freeze most of them. Never done a filling with bacon, looks great! OH SNAP! I just made some pierogies too. Great minds think alike. Uh… what? 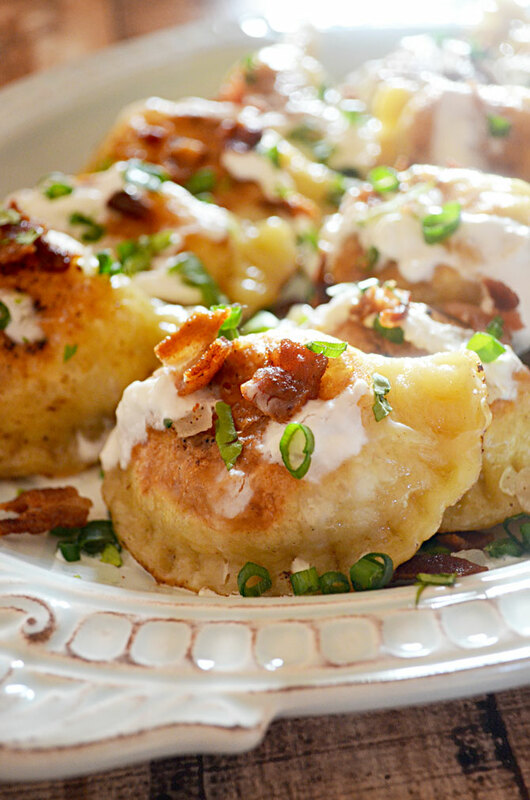 How did you know pierogies are MY FAVORITE but I’m terrified to make them? Holy..
Planning on making these this weekend. 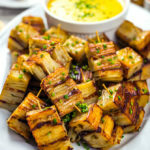 If I wanted to fry them, would I do this after I boiling them or instead of? Thanks! That’s exactly what I did =), just boil them first and then fry! Oh. my. word. I need these in my life immediately! They look ridiculously good!! I made these for my husband today. He was so happy and almost didn’t have any left to freeze! Thank you for this amazing recipe. Thanks, great recipe. To freeze, do you boil first then freeze? One of my favorite foods! 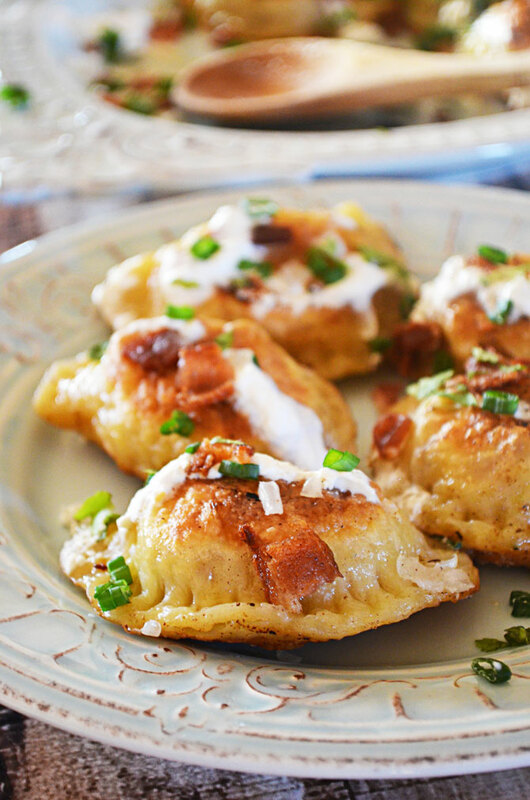 Your pierogi look delicious! I love to make pierogi for Easter – stuff & boil the pierogi and then freeze them in a single layer so they don’t stick together. Sure helps to make them in advance before a party. I’m not sure what the issue here could be. Are you not rolling out your dough thin enough, perhaps? If you still have an issue, try kneading just a sprinkle of water into the dough and see if that prevents it from breaking. Let me know if that works for you– if not we will figure it out! Made these. super easy! way more easy than I could believe! dough was easy to work with, filling was even easier. Tip: make the filling the night before and refrigerate overnight for easier handling. Also, my boyfriend enjoyed the thinner skinned ones, so rolling the dough thinner is another tip. And then using a fork to seal the edges give a great look! thanks for the recipe. can’t wait to take a few out of the freezer for whenever I’m craving them! I would love to bite into this and just see what’s in the middle. I probably would be the worst in a kitchen.. You wouldn’t have many left to photograph. That’s actually the problem I have when I cook my own recipes for my food blog… *Sigh* Lol!! Nice recipe! Excited to try!! Making these Friday for my polish father-in-law! Does it have to be red potatoes or would russet potatoes work? 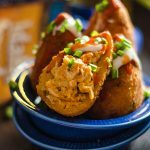 I made these last night, and they were fabulous! My only comment is I didn’t have a ton of time to let the dough rest in the fridge which I believe effects its elasticity so when I started making them I realized there was way more filling then dough. I think next time I would either 1.5 or double the dough measurements, but maybe that wouldn’t be the case if I had let the dough sit longer. Simple and delicious! I doubled the recipe and froze half of them. 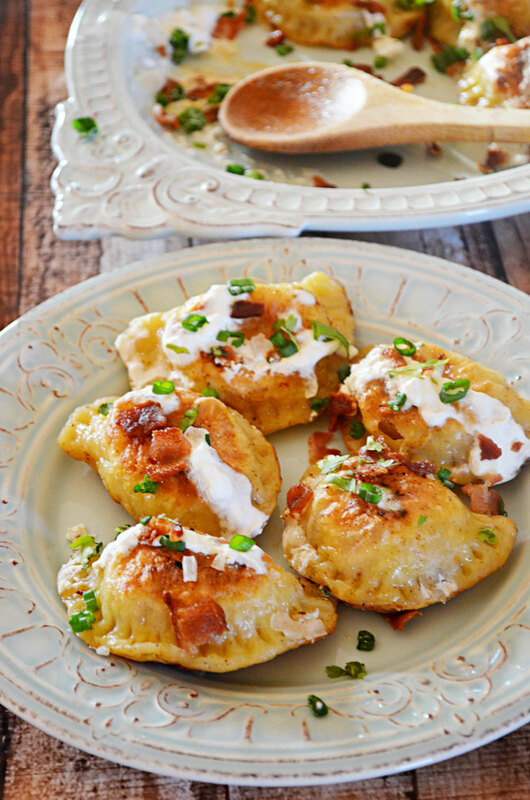 This is a wonderful recipe and explained perfectly for us new to making pierogies. My family can’t get enough of these, and they are so easy to make! Thanks for the awesome recipe! My family loves these, and they are pretty simple to make. Thanks for the great recipe!